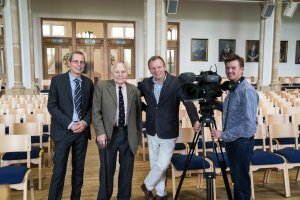 You may recall reading about the BBC coming into school back in May, to film inside our Great Hall for a documentary they are making about the unique role that Bedford and Bedford School played during World War II. At the start of Work War II, because of the threat of bombing in and around London, various departments of the BBC were relocated to other parts of the UK. In the latter part of 1939, The BBC Symphony Orchestra and The BBC Theatre Orchestra were sent to Bristol for several months where they enjoyed the use of Bristol’s famous Colston Hall. However, as the blitz took a more intense grip in September 1940, major cities including Bristol, became increasingly under attack by German bombers. The Mayor of Bedford at the time, offered the BBC the use of several locations around Bedford including the Corn Exchange, St Paul’s Church and Bedford School. And so, in 1941 the two orchestras left Bristol on a long and unconventional journey (avoiding London), eventually settling in Bedford, which would be their home for the next four years. 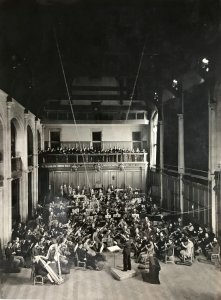 Unbeknown to the listening public – for reasons of national security – The Symphony Orchestra broadcast to the world from Bedford Corn Exchange and on occasion, because it was still a functioning corn exchange, there were times when the 200-strong orchestra needed an alternative venue. 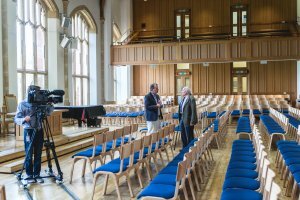 And so the Great Hall at Bedford School with its wooden galleries and great acoustics, soon became one of the orchestra’s favourite locations. During the interview, Derek told us how he thought of Bedford School as his home and still has clear memories of hearing the orchestra rehearse. “In the evenings, we were allowed to go and watch the orchestra play in the Great Hall and listen to the choral singing in the School Chapel, which I loved” he fondly recalled. “I didn’t appreciate how privileged and lucky I was at the time – it was just part of everyday life”. In fact, in February 1942, the BBC transmitted a Sunday morning service from the School Chapel, which was broadcast Europe-wide to boost the morale of servicemen held in occupied Europe. The BBC aims to capture this hidden yet very exciting time in Bedford in an episode of their real-life documentary series ‘Inside Out’, which will be aired on 23 October at 7.30pm on BBC1 (East) – you will also be able to view it on the SKY Box and iplayer for a week following this. The programme will also feature an interview with local historian and Old Bedfordian David Fowler (47-56) who describes the part the town and school played during this special time. Old Bedfordians Alistair Gray (66-72), Derek Gray (36-44), Shaun Peel, Presenter of BBC’s ‘Inside Out’ and Martin Giles, Cameraman. The BBC Symphony Orchestra at rehearsal under Clarence Raybould, the Chief Assistant Conductor. Taken in the Great Hall, Bedford School, 5th June 1944.